In The Language Archive, Playwright Julia Cho invents a repository for endangered tongues, then tongue-ties its multilingual archivist in matters of the heart. Mark Brokaw’s playful direction helps elevate the irony to fable, while Leo Marks’ pitch-perfect turn as the bottled-up linguist launches the play with comic self-delusion worthy of a Danny Kaye film. The production continues through April 25 at South Coast Repertory, where in its final weekend it becomes the cornerstone of the theater’s annual Pacific Playwrights Festival. Commissioned by New York’s Roundabout Theatre, where Brokaw is an associate artist, The Language Archive has already won both the 2010 Susan Smith Blackburn Prize for outstanding new English-language play by a woman and a slot in the Roundabout’s 2010-11 season. Cho previously explored the affects of not sharing deep feelings and fears, on the uneasy road trip of a secretive father and his teen sons in Durango and in the unraveling of repressed memories in The Piano Teacher. However, while in sight, the proper weighting of main and secondary themes that successfully drove those narratives is still down the road for The Language Archive. In this first production, we’re left with a message that love – whether lost or found – is the dominant life force. Cho admirably has accepted the uphill challenge of building her story around a lost soul lacking self-awareness and direction. We’re not sure if George (Marks) is simply incapable of expressing love or if he doesn't feel it. But, because he is as incapable of growth as the dead languages he archives, other colorful characters and their stories pull the narrative onto side paths. We end with both the play’s protagonist and forward motion back at the crossroads, in a tangle of messages about love indispensable, love inexpressible and love unattainable. George created the Archive to hold the tongues of soon-to-be-lost cultures. His library contains 500 recordings of conversations between the last speakers fluent in as many languages. He tells the audience that of the estimated 6,500 currently in use, one more goes silent each fortnight. 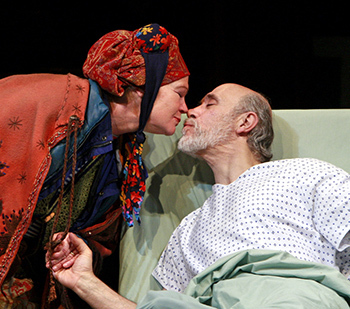 Alta (Linda Gehringer) and Resten (Tony Amendola), a married couple who arrive for their recording session, in layered couture by Costumer Rachel Myers, like Balkan Bickersons, are the only folks fluent in Elloway, a language Cho made up. The veteran spouses will demonstrate committed love's daily, hair-pulling angst as well as its singular path to life-fulfillment. George and his assistant Emma (Laura Heisler) record the Ellowans’ nitpicking for posterity. 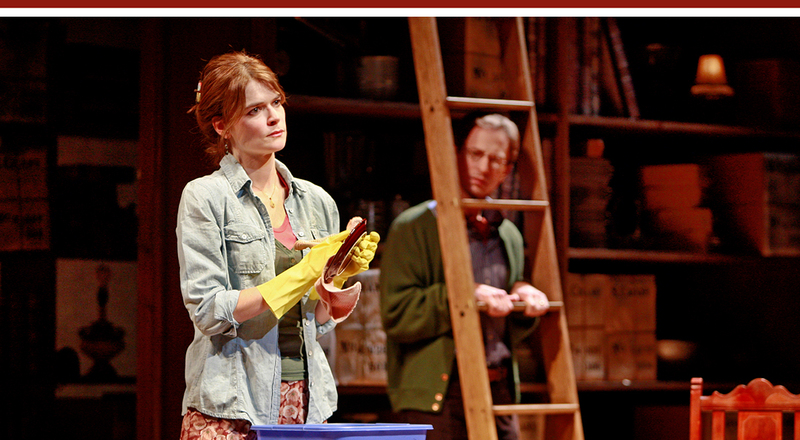 But, while he’s saving another doomed language, lack of communication is dooming his marriage to Mary (Betsy Brandt). In a beautiful opening scene, a buoyant Marks demonstrates George’s attempts at better-half behavior. As focused as a diver inflating balloons within a sunken ship, he attempts to lift Mary’s spirits. Whether it’s because he can’t find the words to share his love, or has no true love to share, Mary is unmoved. She continues leaving provocative scraps of communication that – to George – are incomprehensible. MARY “That’s not exactly what you said. And so Mary begins a journey that adds a fairy tale dimension to the fable. She meets a baker named Baker (Amendola), who gives her a bread starter passed down to him through the generations. With the active agent of her former passion – she was baking bread the day she met George – she takes over the Baker’s bakery and restarts her life. No idle tangent, bread is another powerful symbol. (A quote from H.E. Jacob’s Six Thousand Years of Bread is on the frontspiece of the script draft. Meanwhile, George’s assistant Emma (Laura Heisler) is bursting with unrequited love for her boss. To reach him she learns Esperanto, developed by L. L. Zamenhof to serve as a universal, non-proprietary language that might open communication between cultures and lead to global understanding and peace. Emma’s teacher is yet another strong character (Gehringer) with a diverting story to tell about a Dutch lover who, in the process of breaking the German instructor’s heart, opened it to future passions. In addition to Marks’ endearingly bemused George, Brokaw has a fine cast of SCR favorites. Brandt gives Mary a sympathetic mystery for the opening exchanges before letting her flower among the loaves. Amendola, a mighty Doctor in SCR’s The Heiress, employs one of the great stage personae in the region to give dignity to the cagey Resten, an insightful cab-driver, and a dreamed of Zamenhof. Gehringer, who helped make The Piano Teacher a revelation, adds her solid talents while newcomer Heisler is poignant in her hopeless quest for the linguist’s heart. Set designer Neil Patel has created a wonderful unifying environment: floor-to-ceiling library stacks that glide slightly to alter locations. A large wooden table provides the focus, changing from Archive desk, to kitchen table, to train platform and taxi. Mark McCullough’s lighting keeps the set visible without it becoming distracting, and the original music and sound design of Steven Cahill – from the roar of commuter trains to a tinkle of magic – are enchanting. During the run, as the linguist and his assistant work to save dying languages, and the other characters struggle to demonstrate the power of love, Cho will be studying their every word. During the play festival, another hundred of the country’s professional play doctors will be in the operating theater. With measured adjustment, Cho’s fable about lost love and language is sure to rise from the occasion. 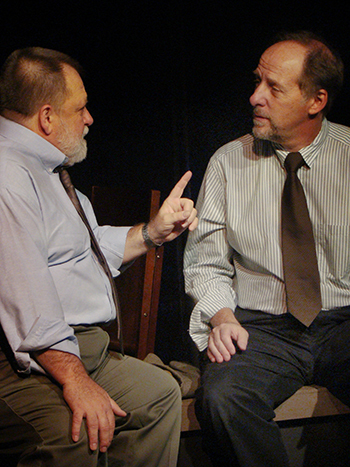 Tony Pasqualini’s Loyalties, now premiering at the Pacific Resident Theatre (through April 25), is raw family drama served by a balanced six-member cast (including the playwright) under David Gautreaux’ direction. The bond between two couples, parents of best friends who enlist in the Marines, strains when one dies in Iraq. Loyalties explores the national and personal fractures caused by American wars borne by only a fraction of Americans. The death of Donny, their only child, has made Frank (Michael Rothhaar, in for Paul Linke at this performance) and Joy (Robin Becker) outspoken advocates for the cause of their loss. They speak as if their ultimate sacrifice has elevated their opinions to unassailable truth, and presume every loyal American feels the same way. Andrew (Pasqualini) and Mel (Karen Landry, in for Sarah Brooke), listen diplomatically, fearing that this solid stand for national strength is all that keeps their friends from crumbling under the grief. Andrew and Mel’s only child, Michael (Albert Meijer), is at Marine boot camp, and worried where following in Donny’s footsteps will lead. When he and his supportive girlfriend Karen (Lisa Cirincione) unexpectedly arrive to question his decision, Andrew and Mel must finally take a side, and decide which loyalties get priority. Playwright Pasqualini unfolds his story smoothly, with an even distribution of fireworks for this fine ensemble. Some plot devices planted along the way protrude a bit: Frank’s gopher campaign is extreme but explicable; Andrew’s self-medications less so. Actor Pasqualini gives Andrew a slow fuse that burns cautiously towards the second act explosions. Rothhaar is properly overbearing and gives Frank’s final scene just enough calm to signal a substantial change. Becker makes Joy the kind of insufferable crusader whose personal tragedy moves the nation forward. A suddenly childless parent, she is driven by the same need to memorialize a victimized child that has led to Amber Alerts and Megan Laws. She chairs a rabid if not radical group of mothers looking for ways to wake up the Americans “oblivious to what is going on in the world.” She also plays the tightly wrapped wife of an inflexible husband, showing both support and strain in that relationship. Mejier and Cirincione are also excellent. Gautreaux draws well-modulated performances from them, especially in one of Pasqualini's best scenes, in which Karen finally speaks her mind. It is beautifully-sculpted showcase for young actors that should be a staple in college acting programs. At this performance, however, the biggest laurels must be tossed at the feet of Ms. Landry, who was only stepping in for (reportedly) her third time. Gautreaux has directed this so tightly, and demanded such emotional commitment, that there is no room for fumbling or false notes, and Landry set a very high bar for understudy or substitute performance. She was so far off-book you’d think she wrote it. An evening’s work that reminds us of the depth of L.A. stage actors. Loyalties is another reason to make the trip down Venice Blvd. to Venice and the Pacific Resident Theatre. Not only is there this rare drama that, like All My Sons a half-century ago, examine war and its domestic impact through family dynamics, the other space offers The Browning Version, which continues to extend itself after several months. An earnest if earthbound production of Julie Marie Myatt’s Welcome Home, Jenny Sutter opened over the weekend at The Chance Theater in Orange County (continuing through May 16). It is a powerful story about a woman marine, returning with a new prosthetic leg and a justifiable chip on her shoulder. Even if director Oanh Nguyen’s six-member cast fails to deliver all their characters’ potential subtleties, audiences will have a better sense of the confused states in which contemporary soldiers attempt to re-enter society. Jenny Sutter (Brenda Banda) is the wounded Marine who we first meet in Iraq, slowly changing from fatiques to civvies and standing awkwardly on her new leg. A beautiful opening monologue explains that Jenny was originally from the high-desert outpost of Barstow. As she returns to California we are unclear about her current home and family. In a Los Angeles bus station, Banda's properly grim and tight-lipped Sutter refuses clumsy efforts at friendship from the lonely station agent (an endearing Maxwell Myers). When another lost soul (a bubbly Jennifer Ruckman) arrives to buy her ticket to the desert town of Niland, Jenny tags along. Despite the seemingly random choice to follow Lou, there is comfort in the desert destination. The open sandy spaces connect chlldhood, battleground and now this desert detour. Chance now leads the former Marine to a former Marine base. Jenny and Lou arrive in "Slab City," the base decommissioned after World War II that has been home to squatters and an RV destination ever since. Its unstructured social network may be just what she needs to reorient. The curious influence of chance is echoed in a couple of impromptu card games that Jenny plays. They arguably set the endpoints of the arc of Jenny’s letting go. 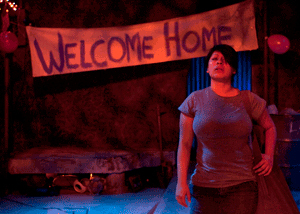 During the play, Jenny will work out her anger and fear as the Slab City residents cautiously rally around her, despite her distancing, and give her a heartfelt welcome. These strangers include the group’s self-appointed spiritual leader, Buddy (Casey Long), a victim of physical abuse “ordained” online, who has an on-again-off-again relationship with Lou. Cheryl (Karen Webster), another drifter who provides amateur therapy to Lou, now offers guidance to the wandering, wounded soldier. And Donald (Brandon Sean Pearson), a wirey stretch of hardscape, manages to be both frightening and flirtatious. Although anger is understandably percolating below the surface of each character, the over-employed outburst of yelling, rather than reaching our hearts, just lodges in our ears. We miss the build, the connection, the reliance on the words. Nguyen, the Chance’s Artistic Director, has chosen to change the opening scene’s staging. Stage directions call for Jenny to give her reverie from an army cot, until the speech is punctuated by the sound of the disfiguring bomb blast. Military Police then attempt to move her cot, but she waves them off with “Wait. I’ll make my own way.” Here, there’s no cot, bomb or MPs. Including them might better establish a viseral and aural link to Jenny's resentment against the war, people, fate. In its place we see her arduously getting dressed and then standing on her prosthetic leg. "Wait," she says to no one in particular, "I’ll make my own way." Myatt, whose plays rise on the power of the unexpressed and inexplicable, are tricky for actors used to wearing emotion on their sleeve. Previous productions of her plays reviewed here include Someday, Cornerstone Theater’s Justice Cycle drama about reproductive rights; My Wandering Boy, in which an enigmatic central character vanishes, leaving friends and family to wonder why; and The Happy Ones, a story about how two men from clashing cultures reconcile their tragic, inter-connected losses. The compact Chance performing space has been reconfigured to give the actors a dominant area, stretching the length of the room between banks of seats along the side walls. Shaun Motley designed the set, Anthony Tran the costumes, KC Wilkerson the lights and Dave Mickey the sounds. It’s a fair mounting of an important work with a powerful message. As the writer has said in interviews, she hopes audiences will be a mix of those who bore the burden of recent wars and those who have experienced it second hand if at all. Hopefully this Chance production will draw crowds from all sides.